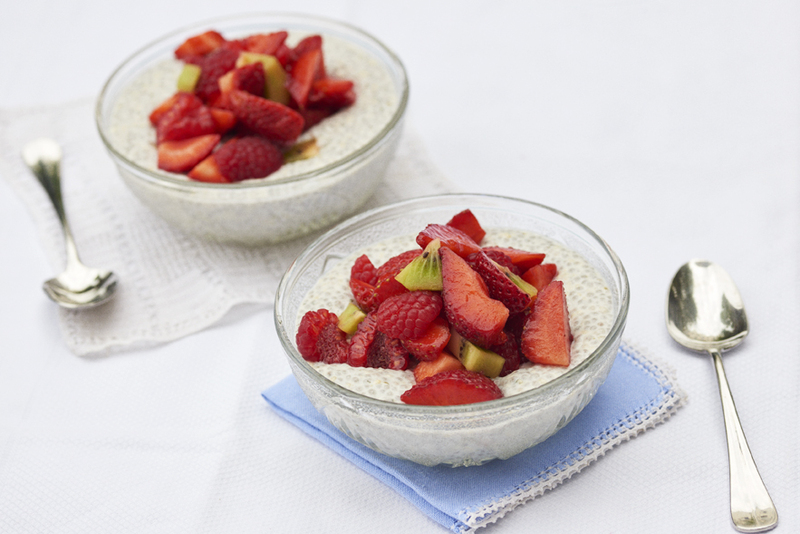 This week I’ve been craving a chilled breakfast pudding that would replace porridge on a hot summers morning. Strawberries are now in season and, it’s Wimbledon… so they were a must! I love this recipe; it just takes 5 minutes to mix together the pudding ingredients the night before, then chill overnight and in the morning you have delicious, nutritious breakfast!! Top with chopped strawberries (or any seasonal fruit of your choice) and enjoy!! As a side note; Chia seeds have many health benefits. They are rich in Omega-3, which is brilliant for vegetarians and are a great source of essential healthy fats. As an added health bonus, I have added hulled hemp seeds as they are high in protein, omega 3, iron and magnesium. Place all pudding ingredients in a bowl and mix well. Leave in the fridge overnight to soak. Serve in small bowls or glasses topped with the chopped fruit and a squeeze of fresh orange.